The poison ivy rash is a familiar summertime hazard. Poison ivy causes an itchy rash that takes days to go away. If you've been out in the woods or working in the yard, and you develop an itchy rash, there's a good chance it's poison ivy. However, there are other plants that can cause a rash, not to mention chemicals, insects, heat and sunburn. How can you tell it's a poison ivy rash? Look for the culprit. Did you see any suspicious plants? Poison ivy has three leaves on a single stem. Leaves tend to be shiny with jagged edges. They're green in summer and may be reddish in spring or fall. The plant often looks like a vine, but in colder climates it may grow as a shrub. Consider a carrier. You can develop a poison ivy rash even if you didn't come into contact with the plant. The rash is caused by an oil the plant makes. The oil can be transferred to pets, camping gear, sports equipment, or anything else that touched the leaves. Check the clock. The rash appears about twelve to forty-eight hours after exposure. A rash that comes on more quickly might be due to a direct irritant, like a chemical. The rash itself begins with itching and red and/or swollen skin. Soon, blisters filled with clear fluid appear. The blisters will crust over after a few days. After that, it can take a week or more for the rash to heal completely. 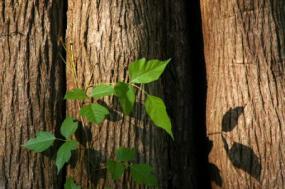 The rash caused by poison ivy is an allergic reaction to an oil in the plant. The oil is called urushiol. Just like some people get hay fever and others don't, some people are more allergic to urushiol than others. Poison ivy allergy is very common. Only about 15 per cent of people can touch the plant without getting a rash. Others will develop anything from a mild rash to a very itchy, angry-looking inflammation. How bad the rash is also depends on how much oil was deposited on the skin. Many people think that a poison ivy rash spreads when a person touches the rash and then touches another part of the body. Actually, once skin is washed with soap and water, there's no poison ivy oil left to spread. The rash appears at different times on different parts of the body because skin in some places is more sensitive than in others. The sensitive skin reacts more quickly to the poison ivy. 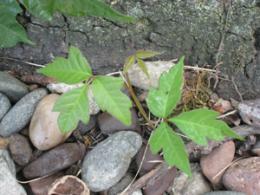 Treatment for poison ivy usually begins with treatment for the itch. Try cool showers or baths for quick relief. Adding oatmeal powder or baking soda to the water can be soothing. Over-the-counter medications can also help. Calamine lotion will dry the rash and decrease the risk. Hydrocortisone, a type of steroid, can decrease the itch and reduce the redness. When over-the-counter remedies aren't enough, a visit to the doctor may be necessary. Your doctor can offer a stronger steroid cream or a steroid shot, which may halt the itching and help the rash heal more quickly. Try to avoid scratching the rash or breaking the blisters. Although a poison ivy rash will usually heal just fine on its own, it's possible to get an overlying infection. Scratching damages the skin and can make infection more likely. If you think you've touched a poison ivy plant, wash your skin with warm, soapy water as soon as possible. If you recognize the plant immediately after touching it, even washing with cold water can help keep the oil from settling on your skin. Also wash clothing, camping equipment, and anything else that touched the plant.Wear protective clothing if you're planning to be in an area where poison ivy grows. Long sleeves, long pants, gloves, and boots or shoes with socks will help keep the oil off your skin. You can also buy protective creams and sprays at a drugstore or camping supply store. These preparations can help prevent poison ivy oil from affecting your skin. However, you're best off keeping an eye out for the plant and avoiding it whenever possible. Other plants can cause reactions that are similar to the poison ivy rash. Poison oak also has three leaves per stem, and grows as a vine or a shrub. The leaves resemble the leaves of an oak tree. Poison sumac grows in swampy areas of the Northeast, Midwest, and Southeast. It has long stems with multiple leaves growing in a line along each stem.